Photos by Gail Herbert, no reproduction without permission. Stefan Buczacki’s Gardening Britain was a six part series transmitted in 1996 on BBC 2. Stefan travelled round Britain dispensing gardening advice. This series was recorded as a two camera outside broadcast. The producer was Clare Boulter and the series producer Clare Stride. (The end of run meal features in the photos). Stefan Buczacki’s Gardening Roadshow was a similar gardening advice show produced at Pebble Mill in 1998 for UK Style. Again it was recorded as a two camera outside broadcast. The crew for the series included cameraman Nigel Davey and Noel Paley, and sparks Herbie Donnelly. 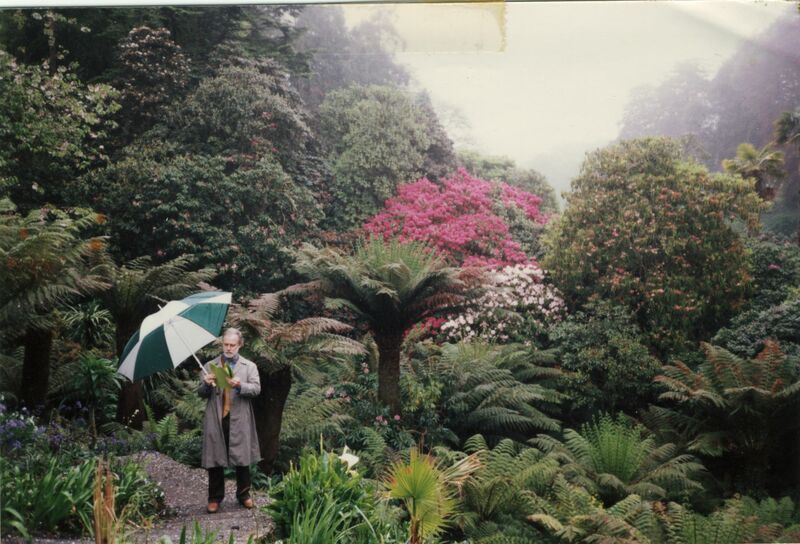 Stefan also presented several stories for Gardeners’ World in 1990-1, including a feature on the restoration of Heligan Gardens in Cornwall, shown in one of the photos (Stefan with umbrella and palm trees). Stefan also presented a series for UK Style called Stefan’s Ultimate Gardens, where he helped garden owners create a particular style of garden. This series was recorded single camera. Series producer Vanessa Jackson, director Paul Newman, researcher Emily Rusted. Thanks to production assistant Gail Herbert for sharing her photos.